Aeration is that engineering process by which air is circulated through, mixed with or dissolved in a liquid or substance. In coming days water is the most valuable liquid on the earth. Aeration treatment of sewage plays the most important role to recover some extra water for reuse. Below information will give you some insight of Aeration, which required in sewage or wastewater treatment. So, the Sewage is the main liquid waste containing some solids produced by humans which typically consists of washing water, laundry waste, and other material. This wastewater goes down drains and toilets from households and industry. It is the process of removing contaminants from wastewater and household sewage. Hence it includes physical, chemical, and biological processes to remove physical, chemical and biological contaminants. Conventional sewage treatment involves primary, secondary and tertiary treatment. In primary treatment, sewage is held in a quiescent basin where heavy solids can settle to the bottom while oil, grease and lighter solids float to the surface. In secondary treatment, dissolved and suspended biological matters are removed by anaerobic or aerobic digestion. It requires a separation process to remove the micro-organisms from the treated water prior to discharge or tertiary treatment. In Tertiary treatment, Treated water is disinfected chemically or physically prior to discharge into a river, lagoon, sea or it can be used for the irrigation. Aerobic digestion is a bacterial process occurring in the presence of oxygen. Under aerobic conditions, bacteria rapidly consume organic matter and convert it into carbon dioxide. Sludge refers to the residual, semi-solid material left from industrial wastewater or sewage treatment processes. It can also refer to the settled suspension obtained from conventional drinking water treatment and other industrial processes. Activated sludge is a process dealing with the treatment of sewage and industrial wastewaters. The goal is to remove as much solid organic material from the wastewater as possible. What is the mean by Aeration? Aeration is the process by which air is circulated through or mixed with or dissolved in a liquid or sludge. It is the process of adding oxygen to sludge or sewage. The purpose of Aeration is to reduce the amount of organic matter and the number of disease-causing microorganisms present in the sludge. Hence Aeration provides a way to help clean up sludge and improve sludge quality. 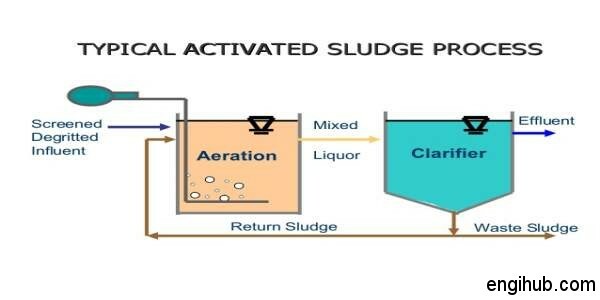 What is sludge activation process? The activated sludge process is a biochemical process in which aerobic bacteria consume the organic pollutants in wastewater. Since the bacteria are aerobic, their efficiency of consumption is very dependent upon the amount of available oxygen dissolved in the liquid sludge. What is the purpose of Aeration? So, the purpose of aeration is to reduce the amount of organic matter and the number of disease-causing microorganisms present in the sludge. Aeration is the improvement of the physical and chemical characteristics of sludge for other purification process or disposal or waters for public supply. Primarily, this improvement involves the reduction of objectionable odors of sludge. Aeration can help to keep up with the demand for dissolved oxygen. Aeration increases the level of dissolved oxygen so normal biological processes in sludge can become balanced. What are the different methods of aeration? In this system, motor-driven aerators are floating on the surface of the wastewater. The aerators provide two functions: they transfer air into the basins required by the biological oxidation reactions, and they provide the mixing required for spreading the air. This type of aeration will use either a compressor or blower. A blower is high in volume of air produced but cannot pump air very deep. The compressor is low in air volume but can push air much deeper. A compressor with a diffuser assembly can be very effective at moving the water and transferring oxygen at the air/water interface. Pure oxygen is typically added to high-density aquaculture systems. This can be done via an oxygen generator as well as through purchasing oxygen in cylinders. What affects dissolved oxygen level? Barometric pressure, altitude, salinity, water purity, and biological oxygen demand all affect the amount of naturally occurring dissolved oxygen levels in water or sludge. Colder water holds more oxygen than warm, water at higher elevations or with higher salinity levels has a decreased saturation level of oxygen. What are the advantages of aeration? 01) Improve overall sludge quality. 02) Speed up the rate of organic decomposition. 03) Reduce the amount of phosphorus, which would otherwise be available for growth of unwanted matter. 04) Decrease the severity of algae blooms. 05) Shift the level of carbon dioxide by venting it into the air. Reverse Osmosis: How to purify Sea Water?